Kauai Kayak Tours | Wailua Kayak Adventure & Hike to a Secret Waterfall! 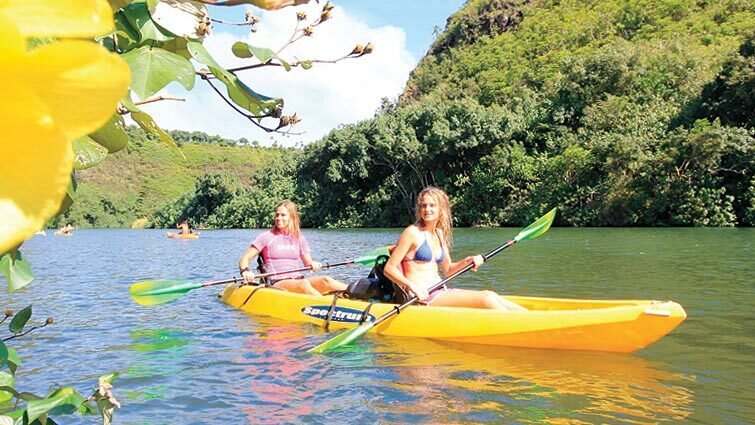 One of the best ways to see the hidden places on Kauai is on our Wailua River kayak adventure. Of all the various activities available on Kauai, kayak tours have the least amount of environmental impact and will bring you up close and personal with our island’s unique places – Wailua River, lush rainforests, and Secret Falls. Let us guide you through the Valley of Royalty. 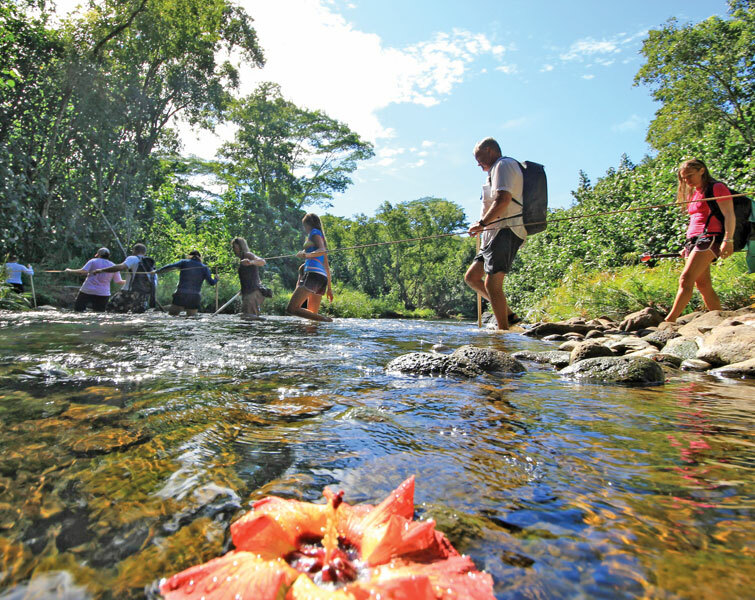 On our “Wailua River Kayak/Hike Tour” we promise to provide you with the best equipment and service that money can buy. 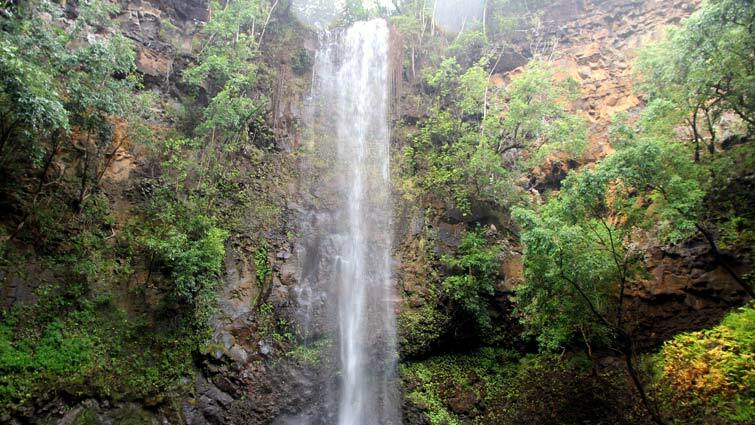 Our Expert Guides know the Kauai you are looking for, so let us share it with you. Alii Kayaks is a Full-service Guided Kauai Kayak Tour operator, conveniently located on the Wailua River on the island of Kauai. Take an eco-adventure Kayak/Hike and see a Secret Waterfall! This is an easy going Hawaiian Style kayak paddle on a Class Zero river combined with a moderate hike through a rain forest, wading through streams, traversing muddy trails; a definite rock solid adventure. For individuals without paddling experience our guides will provide you with instruction, assist you with your launch and accompany you for the duration providing assistance where needed. They know tricks and tips that will make your journey as easy as possible. We provide all the Kayak Equipment, including backpack style Dry Bags for your carry along items. You can feel safe with our guides who are Water Safety Instructed, as well as CPR and First Aid certified. 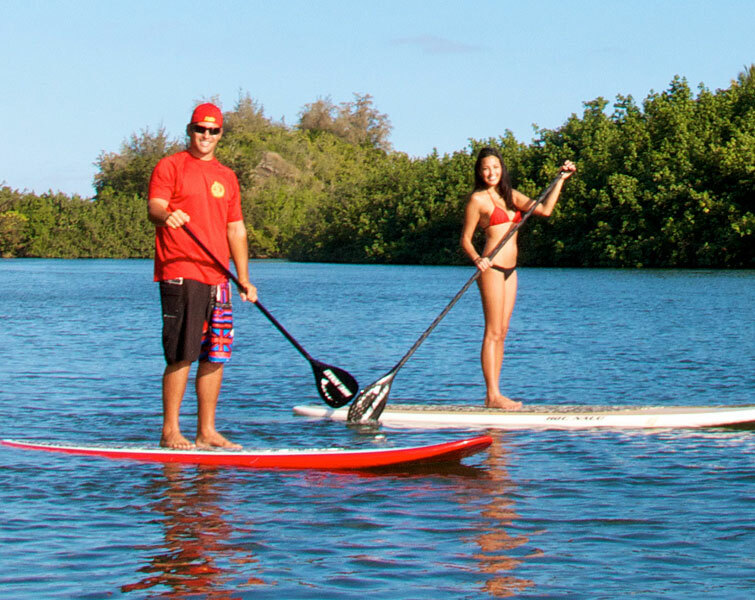 Stand UP Paddle board Rentals are also available Daily. In 1946, Walter Smith, Sr. and his wife Emily, started the Smith’s Motorboat Service on the Wailua River, pioneering the river boat tours to the world famous Fern Grotto. Four generations later, Kaleo Smith and his business partner Keone Garma, along with their wives continue the family tradition of sharing their love of Kauai and its rich cultural heritage. Alii Kayaks has to be one of the best kayaking experiences on the Wailua River. We had a great time kayaking and hiking through the beautiful scenery to the waterfall. What a fun adventure! We found we were provided everything we needed for our comfort including waterproof bags and life jackets. We were impressed with our guide, Bryceson, who really enriched our experience with interesting facts and playing the Ukulelehe. He was super friendly and took great care of all 11 of us, including providing each of us with our very own walking stick, which was super helpful on the muddy trail. Highly recommended. Our family had a great experience kayaking on the Wailua river and hiking to the falls! The price was very reasonable, and the base office was easy to find. Our guide was funny and knowledgeable, and we enjoyed every moment of the trip, even the mud on the hike. I would definitely recommend this adventure! Dantes(sp?) was a fantastic guide! Knowledgeable, funny, friendly, and just fun to be around. The kayaks and other equipment were all excellent. The adventure up the river and to the waterfall was unforgettable. My husband and I went with our 4 sons ages 7 to 14 and we all loved every second!